Tied to the popular film franchise, Playtech and Marvel movies created the game, Blade. The game focuses on vampire hunter Blade as he takes out vicious bloodsuckers. In the game, he is the wild symbol, while the Blade logo is the scatter symbol. In addition to these icons are icons for 10s through Ace’s, weapon icons and even a female vampire. The in game animations add to the slot experience. The female vampire makes a sinister face and claws the screen when attached to a win. The Firearm rotates and it shows Blade holding it before taking a shot. For the Blade logo, the titular character comes in and splits it in half with a sword. The original symbol then reappears in two pieces. Even the high value cards get splattered in blood with a win. The blood splattering adds to the horror theme of this incredible game. As with many online casino slots, players can choose to play up to 20 pay lines per spin. For each line, players can choose to wager up to 10 coins with a value from .01 – .05. Free spins add to the experience of a slot machine. 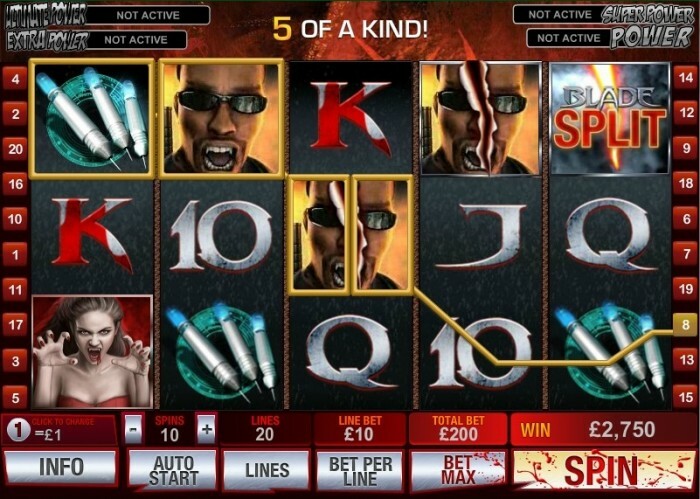 When three or more Blade Logos appear on the screen, players win 15 free spins with varying multipliers. The range the multiplier is from 2x the normal amount up to 5x. If the multiplier is below 5, it will increase by 1x for each win until it hits the maximum of 5. However, non-winning spins decrease it by 1x. With the lowest the multiplier ever reaches is 2x. During the bonus games, the scatter symbol serves as a bonus wild card. This increases the chances of players winning on each spin significantly. During the game, the split Blade logo also counts as a sixth wild. If you have two matching items and a split wild at the end, it would be like matching four items. Four matching items, it would count as six. If you have five Blade symbols in a row and the fifth is split, it would pay out 25,000 coins. If the fifth is a standard symbol, the payout is 2,500 coins. Blade is part of the Marvel Mystery progressive jackpot system. In these games, four levels are played. There is power, extra power, super power and ultimate power. The jackpot game is triggered at random, but there is a greater chance of encountering it at a higher wager amount. One it has been triggered, a grid with 20 squares appears. Players will begin to click on squares. If the first three squares clicked are matching symbols, the player wins the jackpot. The thrill and excitement of the film franchise is perfectly captured in this online slot machine. If you are ready for some vampire hunting fun, look no further than Blade.